This globe integrates the last geopolitical evolutions. The map is on an injected high strength plexiglas sphere; it is practically unbreakable and unscratchable. It will keep its gleaming aspect for many decades. The political * map (switched off) shows the countries in different colours. The physical * map (switched on) shows the mountains, the valleys, the plains, the sea-depths and streams in different colours. The terrestrial relief is rendered by a play of shadows. 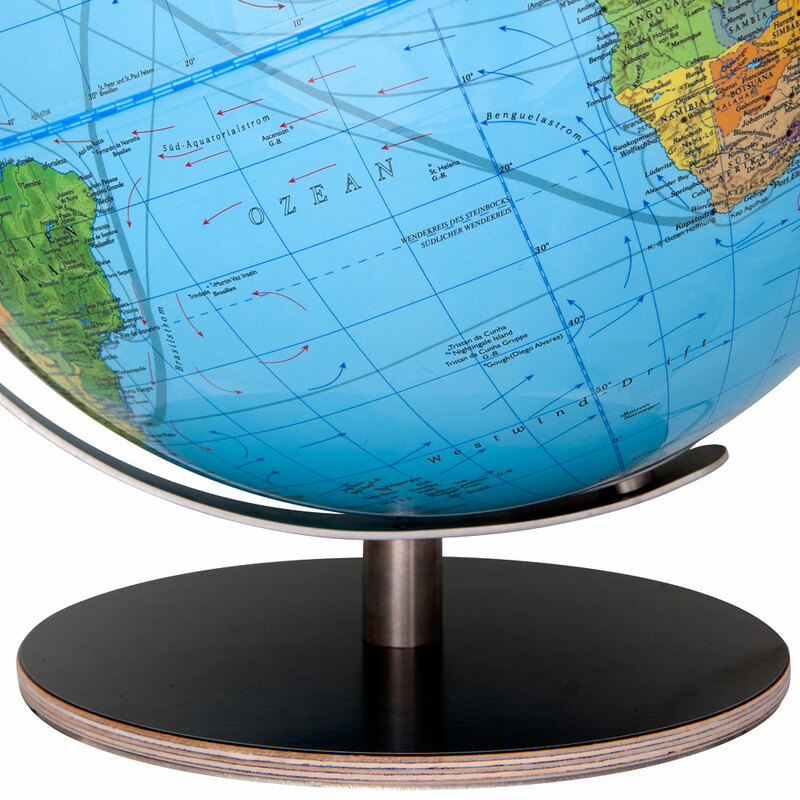 We don't just print our globes; we strive to create an incredibly deep, flawless shine. It all starts in our state-of-the-art 'clean printing room', where our craftsmen work just with superior acrylic sheets. Bringing in all kind of papers is strictly forbidden, because it would bring in fine paper dust particles which could later be attracted in the printing process. Printing up to 17 successive layers of colors, there's a curing process between each layer, along with an inspection and careful cleaning. Once the printing is complete, a high gloss clear coat layer is applied over the entire map, than it is sent back for inspection to our cartographic department. Unmistakable COLUMBUS cartography: Splendour of Elegance. Established 1909 in Germany, COLUMBUS is the oldest globe manufacturer in the World. 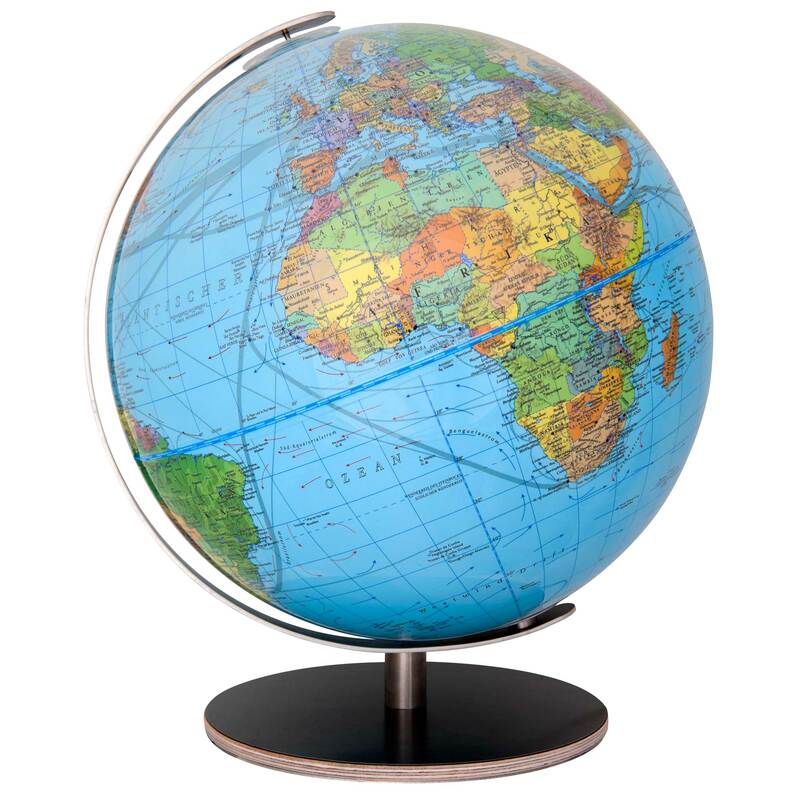 COLUMBUS quickly became and continue to be the World's best-selling line of luxury globes ( Chaplin chose in 1940 the Columbus globe "Die Erde" for his world famous film). Popular features such as internal illumination (1948), dual-mapping (1955), the Day and Night Globe (1972) were all innovations introduced by Columbus globes. While being innovators and leaders, Columbus is also focused on preservation of traditional globe manufacturing processes such as the exclusive mouth-blowing of crystal spheres and the hand laminating of cartography. Average of 4,1 based on 71 reviews. Back to list "High Resistance Worl..."
All orders are payable in €. Prices displayed in an other currency are only approximate and not contractual. They are based on the exchange rate of . Mouse-over displayed price shows the euro contractual price.